My favorite method for roasting potatoes and sweet potatoes came about because a South African friend told me how his mom made the best roasted potatoes around and under a chicken when she roasts a chicken. He said the potatoes get very crispy on the outside but very fluffy inside. I’ve roasted vegetables under a chicken . . . without getting the effect he talked about. But researching what might be his mom’s method, I realized that, with the chicken poised above the vegetables on a rack, the potatoes probably steam from falling juices and then, as the moisture evaporates from the cooking chicken and potatoes, fry in the chicken fat that remains. I was making dinner for my friend and his wife the afternoon he told me about his mom’s potatoes. I already had lamb planned, so I decided to try a different method for the potatoes. To mimic the steaming, I parboiled cubed potatoes; then I roasted them in duck fat until they were crispy on the outside. Voila! Using this method, sweet potatoes never get as crispy on the outside as the potatoes do (a matter of starch, I imagine), but I think they are even better than the fabulous potatoes. Something about the sweetness, crisp outside/soft inside, and coating of fat makes the sweet potatoes taste a bit like French toast . . . no sugar necessary. They’re a true Paleo treat, and I try to incorporate them in our post-CrossFit recovery meals when we are restoring our glycogen levels. Bring a large pot of water with 1 tablespoon of salt added to a boil. Add the sweet potatoes to the water, and boil them for five minutes. When the sweet potatoes are parboiled, drain them well, shaking them to dry them (it’s good if they mash up slightly). Then sprinkle seasonings on them. Meanwhile, put the duck fat in the bottom of a cast iron skillet or stoneware pan. Put the skillet in the oven, and let the fat melt and heat up for three to five minutes. Remove the skillet from the oven, and carefully add the sweet potatoes to the pan in a single layer. (They should sizzle.) 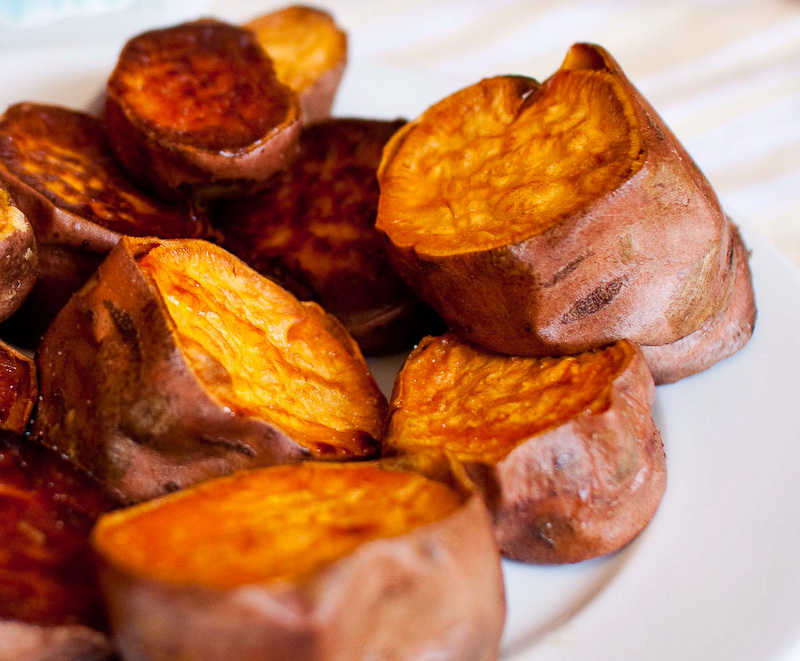 Flip the sweet potatoes over to coat them in oil. Put the skillet back in the oven. Roast for 20 minutes. Remove pan and flip the sweet potatoes, and then roast for 20 more minutes, or until sweet potatoes reach desired doneness.